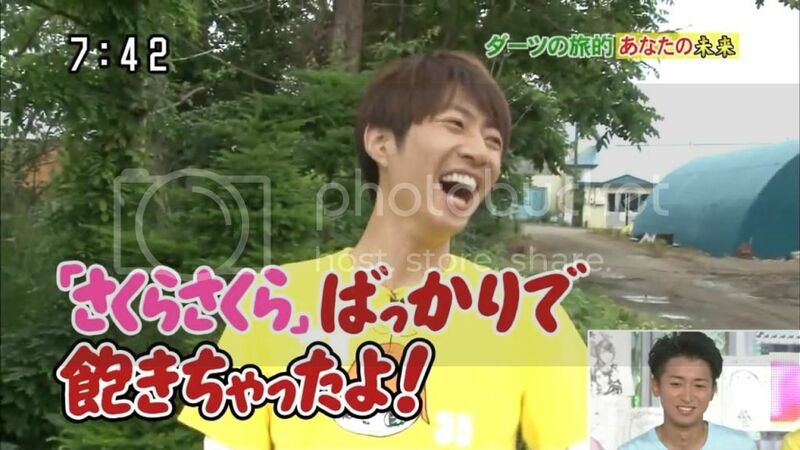 So it's started~ With Kansha Kangeki Ame Arashi, as Smile again~ I'm smiling again~~~ And the whole world smiled. Shh, don't make me said with the reality, thanks. We watched it on Keyhole at first, but I went to tumblr and was determined to find a people who knows a streaming site, I was sure someone needs to stream it. Meanwhile the boys greeted us with Konbanwa Arashi desu~~ then went away to shake hands with fans who were already there to donate money. No need to mention I wanna shake hands with Arashisan, too, right?? I switched my twitter to the Japanese trends, so I could see all of them during the day~ First trend was 感謝カンゲキ雨嵐 then チャリTシャツ after they started to show the videos of the making of the t-shirts. It was super fun~ And 松潤 was trending in Japan :) You should watch it. Some singing~ 24h tv is touching videos+singing all the time. After a footage, they let a singer sing the song related to the video. They gathered a hella lot of comedians for the host's role, so it was mostly chaos -.- Those men just can't shut up or at least not yelling all the time, they totally oppress Arashichan -.- I hate that. Third was the dokkiri XDDDDDDDDDDD Can I cry? x'DDD There were three types. 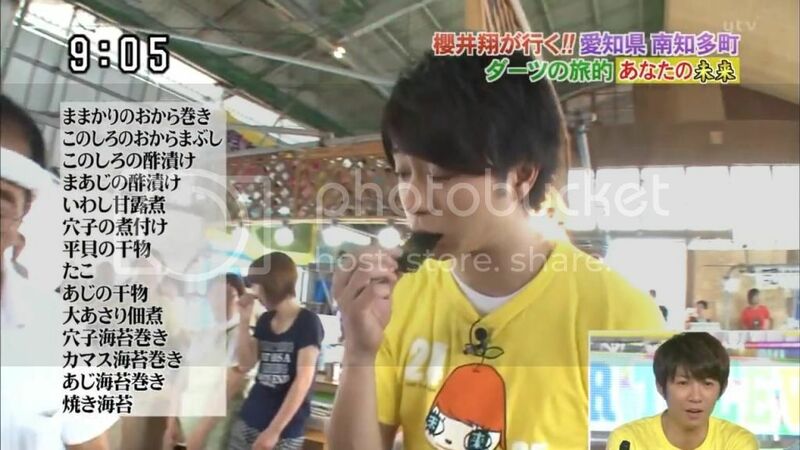 First Sakumiya went to location to make a footage about an exhibition. Then they got surprised by one of the shelves breaking down with many vases on it. As I said they thought they are in an exhibition, so those were supposed to be art needlework x'DDD They were freaked out. Masaki and Jun got surprised by a ghost in the mirror. It was super fun, cause they sat down in front of a huge mirror, and after a little while, right when they looked into it, a ghost appeared instead of their reflection xD Masaki's reaction was priceless xDDDDDDDDD Jun was a little bit cooler, but it was fun, too. 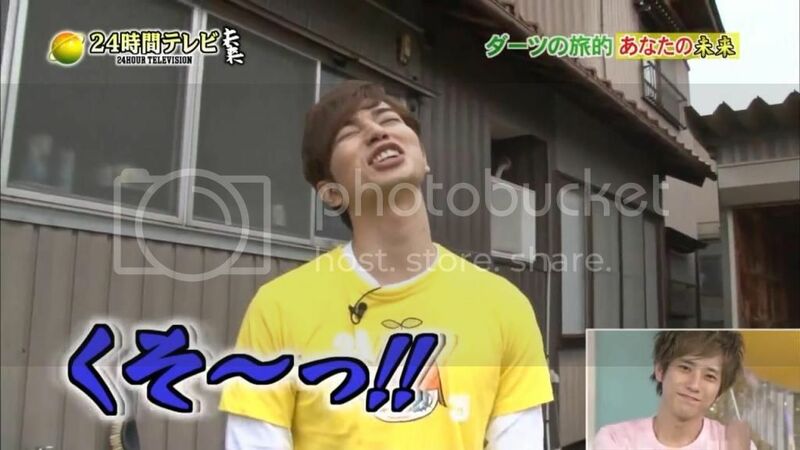 After Shiyagare Sakuraibamiya went to sleep. Juntoshi stayed there for a while with the comedians and Ueda-san for the live Going!, but they disappeared, too. And our suffering started. We should have slept here, really, we were so stupid. We were around 9pm in Hungarian time, but it was already so late in Japan, they knew no one would watch the show, so stupid comedians had a show till morning -.- It was at least four hours of constant yelling. I watched Quiz Show for an hour, then I dunno, but tried hard not to get angry in every minutes. Around half way (well, at that time I thought half way xD It was the starting of the 13th hour, but in the end the whole was more than 24 hours...) a little girl - she was blind maybe? and has some other disease, too - sang us a beautiful song. She has amazing voice, and she played the piano, too. All of us got thrills from her voice. Kensuke-san was still running, but he was on his limit, as I said it was the 13th hour!!! The documentary of Nino's drama came. We got to know the man, they pictured Nino's character after. The whole story about him getting the supporter of many people who wants to commit suicide was really touching. She well deserved a hug from me too!! 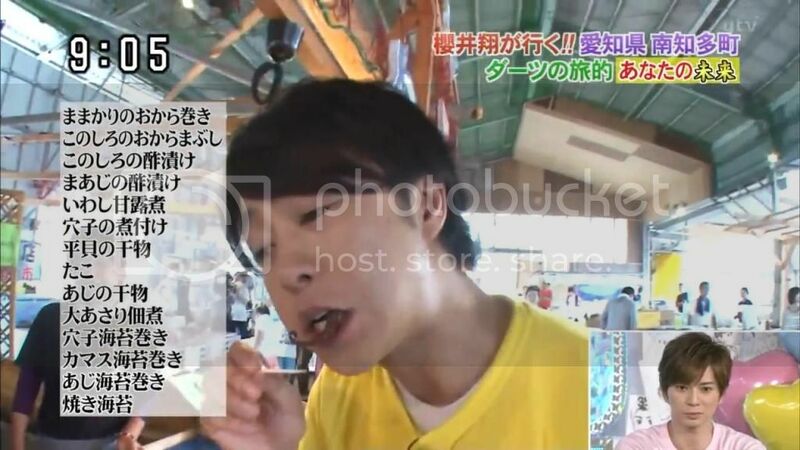 Then two girls recognized him from their cars and went "Are are Sho-chan???" 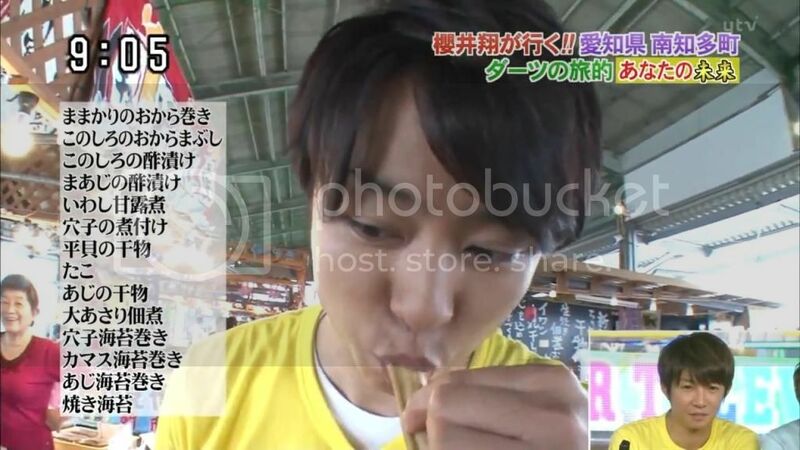 I don't know if he talked with them, but right after the greeting they changed to a little boy~ After he told his dream is to work in Disney land, he mentioned, her mother loves Arashi. 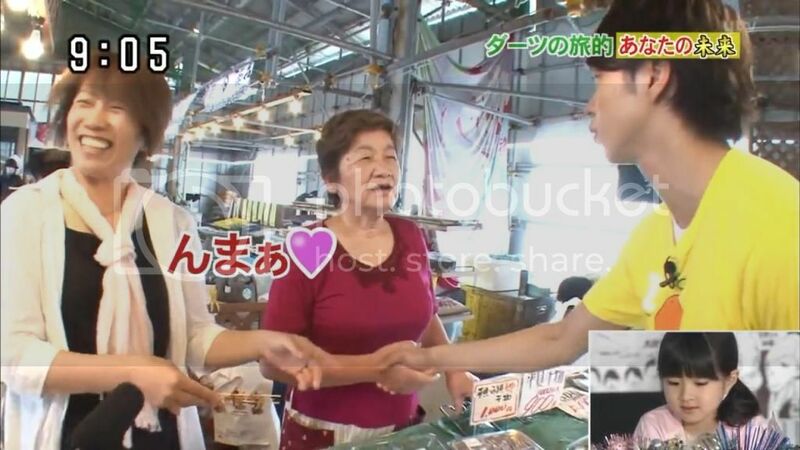 Shosan answered, ah you know what to say, then the boy added, she loves Matsujun xDD // He found a family, where the obaachan - she looked really old - a dai fan of 24h tv, she was fangirling so much xD // Then THE Jiichan xDDDDDDDDD He was super funny!!!! But this segment! IT IS SO GOOD! They are just there for minutes, mostly an hour, talking with common people, old people, kids, families, talking with the nation! I love this. I wish they would change HnA for a show like this ^^"""
The next footage made me angry... There is this woman who became a nurse for the sake of her sick sister. It sounds so nice, ne? She worked really hard for years and everything, but when she was already on the edge of dying, she didn't let her go :/ I understand her reasons, it's really hard to let go of someone, but that woman pulled out her life saving machines, so she was ready still on conscious... Isn't better to die like this, than being in a state, you don't even know who you are anymore, and your relatives watching over your empty body? Ah, never mind. They were repeating "Arashi miteru yo" like crazy :D Oh god oh god~~~ He grabbed a little boy and asked what is his dream for the future: KAMEN RIDER~~~~~~~~ If you don't know what is that, shame on you!!! Omg look at his hands on Sora-kun's body, and the little boy's on his~~~~~~~~~~~~~~~ NINO NO CHIISANA TE GA DAISUKI!!!! Can I be one of you??? I wanna sit next to Nino too!!! The doctors told him, she has no chance against this disease, but her kids were little back then, so she wanted to fight. In the end found a doctor, who told her, they need to cut her organs, there is no other chance to survive. Obviously it led to a life full of burdens. She can't pick up heavy things, she easily gets tired and such. 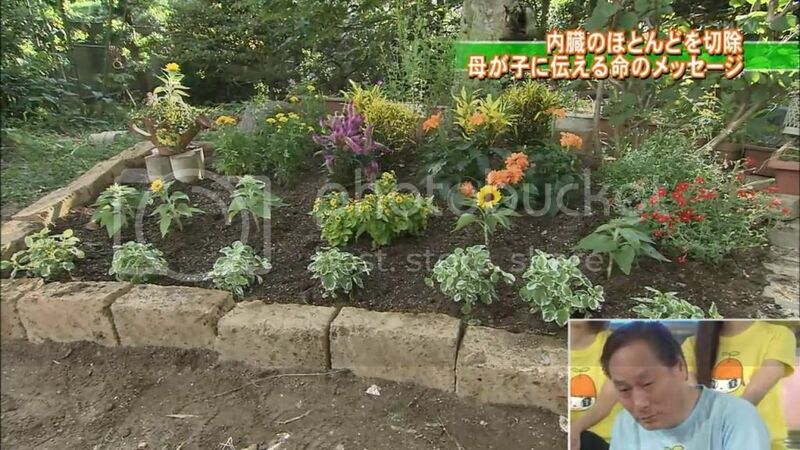 Masaki's task was to help the 15 years old son to create a garden for her mother, who really likes gardening, but can't do it anymore. But the next one was amazingly good <3333333333333333 A little girl has a disease, her body can't grow, and she can't use her legs at all. She was cute to bits. Her dream was to go to France and meet a man who helps imperiled birds to reproduce. He helps them to be born, then grow and in the end to fly! He has a machine, he flies with it and the birds follow him~ The little girl had a chance to use it with him. They helped a bird to learn to have the courage to fly <333 It was beautiful! Next program was one of Ohno-san's tasks, the Dance competition. YOU NEED TO WATCH IT! It was totally awesome *___* Our ojiichan danced, too in the end and showed everything he's got~ And he's got many!!! 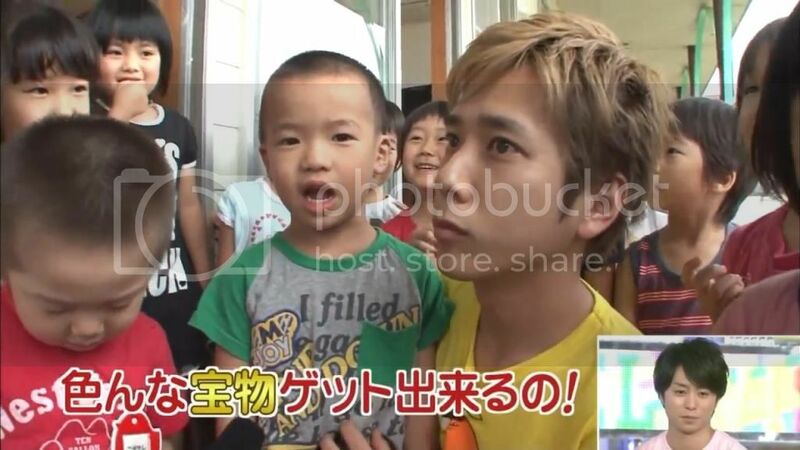 Nino's task was about parents who abuse, then abandon their children. Ah, Mana's Mother in live... They invited a mother who talked about the things she did to her daughter. I've got furious, she talked about all these things so casually like she totally doesn't regert it. They met nowadays for the girl's 19th birthday, and it seemed she was glad to see her mother, they were celebrating, laughing and such. My mind was still full with YURUSENAI. I can't forgive child abuse, I don't care about how frustrated she was, abuse your own blood is unforgivable... So yeah, it didn't make me cry at all, I was just super mad. One of the girls also lost her mother during the tsunami. 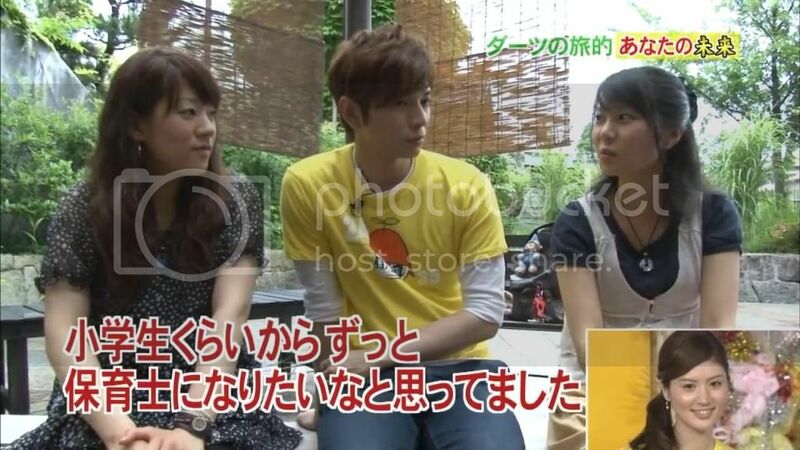 She talked a lot with Jun, even brought him home, because she wanted to introduce her amazing dad to him. He takes care of the girl so good, she is really proud of him. I cried. Hatori-san cried too. Then the performance. If just this one. If just this one. YOU NEED TO WATCH IT! Subarashii, it was just wonderful. Jun is amazing as he is, and the girls did a perfect job! AMAZING WORK!!! Other danger was Hokuto-san, omg she still had 4 kms till Budoukan! She was in serious pain, her legs were ready to give up T___T And the show was almost over it lasted only until 9pm! Of course, this show is about touching moments, so everything turned out the best. So~ After 26 hours and 37 minutes it was over. It was strange, for 26 hours and 37 minutes I felt like I was in Japan. I completely closed myself into my computer, and it was good. It hurt to came out... Yeah... Well, again in four years, ne? Because the top of your yama is wide enough to live on it for four more years, ne~? 2億8240万4461円 was gathered during the show. Hella lot of money, for hella lot of work. Otsukaresama deshita minna-san! 13 Storms | Let's Make Storm!